The author’s house, in the weeks following the storm. Dorcas writes: “The vista that we see now is affecting us. Our feelings are not the greatest at this time. It is stripped and bare, brown and dying, nothing looks right. our whole area will be this way for a while.” Photo courtesy of the author’s father, Merle. Editor’s Note: In the weeks immediately following Hurricane Michael in north Florida, Dorcas Beachy, a friend from Melodie Davis’s Florida days, wrote about surviving the storm and aftermath. “I am 63 years young and throughout my years I have heard the material things of this world described as ‘just stuff.’ Naked I came into this world, and naked I will depart, goes the scripture. “Our days before the storm were like this: Day 1—A strong storm is coming our way. Day 2—I get ready, as I always do, with food, water, batteries, books. Day 3—The path towards us hasn’t changed and I along with my parents, husband, and sister-in-law go thru Hurricane Michael. A category 5 storm (worst possible) at the coast and category 3 at our homes. “I headed into Day 3 thinking it won’t be bad, it never has been. We live too far from the coast to be scared. Somewhere along 1 p.m. I saw the first tree fall. It missed our house, then the dominoes of falling trees began: endless wind and cracking of wood. We could smell the pine inside as it broke outside. I suddenly understood, my life as I enjoyed it was going to be changed. I removed myself to a quiet place and cried. BAM! went a tree as it tore through our attic roof. I cried some more and prayed it would stop. It didn’t stop until 4:30. “Seeing the aftermath of Michael that afternoon is something I and others will never forget. The crisscrossing of huge trees on our driveway, three trees angling out of roofs, my parents seeing the damage to their place, my sister-in-law borrowing my husband’s bicycle to try to ride to her home and see if it was still there, finding part of our neighbor’s roof in our woods. “Now it’s been a few days. We have tried to contain all the damaged areas. We have a building that’s two-thirds a shop for Milton and one-third a playroom for our grandchildren. It is filled with our kid’s stuff from their growing up years. Milton had to tell me the tree sticking through the roof damaged the whole building and I need to empty out the playroom before the next rain. “I have tried to not even look at the outside, tried to sleep in the heat with ringing in my ears. I have forgotten to eat and haven’t bathed in five days. I decided it was easier to “GO” outside then dealing with “GOING” inside. I worry about my parents and the damage they sustained. I search for yet another towel to clean, mop, or dry wet things with. I bag up household trash, spoiled food, dirty laundry and put the bags in the back of the pick-up and watch as the pile gets bigger. “Is it just stuff? NO! It is my life and while I can live without a lot and scale down if I have to, my stuff is important to me. I, we, will be okay. Family, friends and strangers help us all. “In week 4 post-storm, the combat-boot-camp-of-living has changed to electricity-is-good!-but-I-still-don’t-want-to-look-outside. Things are better. Our driveway was impassible, so that is what we addressed the first morning. My husband Milton, began cutting up massive amounts of tangled pines with a chainsaw while Dad and I were supposed to move the logs to the side. We started with an overwhelming feeling: we can’t do this alone, it will take we three a long time! Suddenly a John Deere mini-tractor came down the road. On it were Mattie and her husband; complete strangers to us. They stopped at our drive and said, “We hear you need some help.” They proceeded to push with their tractor’s front-end loader all the way back to Dad’s house, around 600 feet. We still don’t know how they knew to come our way. I was touched by Dorcas’s story—especially the mention of the church where I too was deeply influenced the year and several summers I lived there. All those recovering from this disaster—along with hundreds of thousands around the world at various stages—have been helped by numerous outpourings of help from friends, family and strangers. Recovery takes years. We pray for all going through turmoil at this time of year. 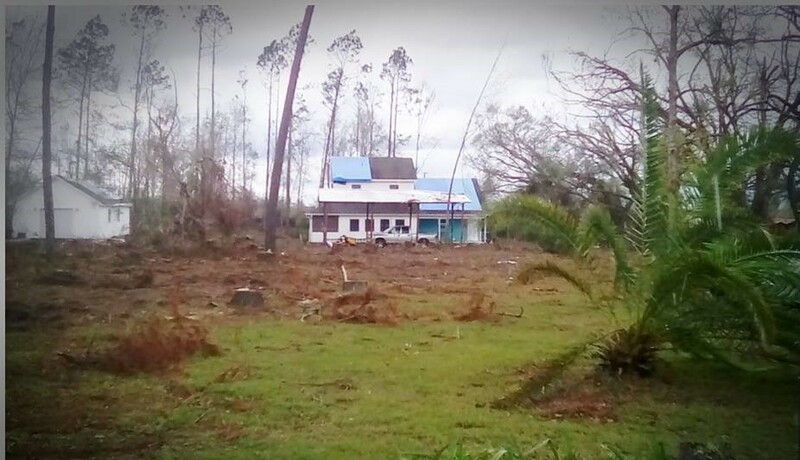 Update: Many families are waiting for new roofs or repairs–reliable contractors have long lists, and church-related disaster relief organizations are not allowed to help those receiving insurance for their damage. So patience and faith keep folks going. Please join me in praying for patience and love for so many families! Your own storm stories from recent times or longer ago? Send to anotherwaymedia@yahoo.com or Another Way Media, P.O. Box 363, Singers Glen, VA 22834. Very affecting post. 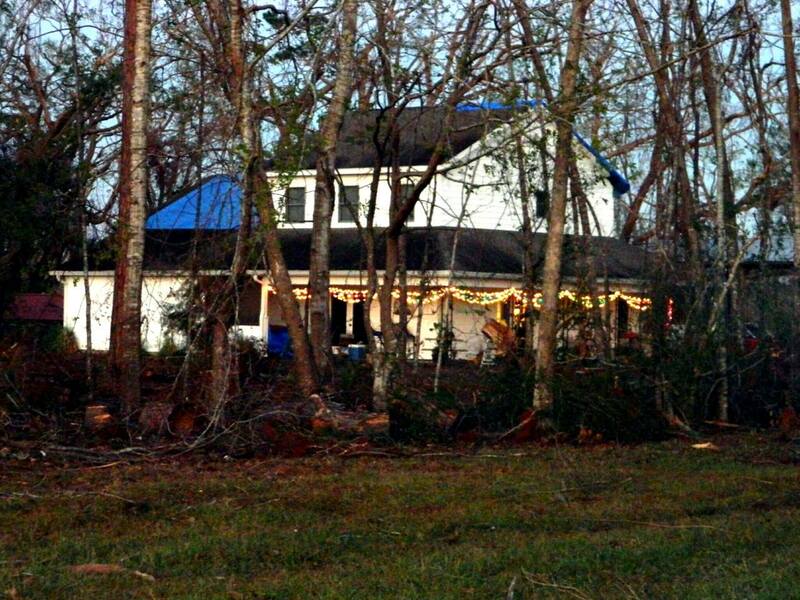 I grieve for Dorcas and many in western Florida who sustained horrific damage. I believe our church sent help: water and man-power. On Florida’s east coast we have had our share of roof damage and downed trees, but not to the extent I’m reading about here. At least not yet! True, it is just stuff, but devastation like this turns the rhythms of one’s life upside down.